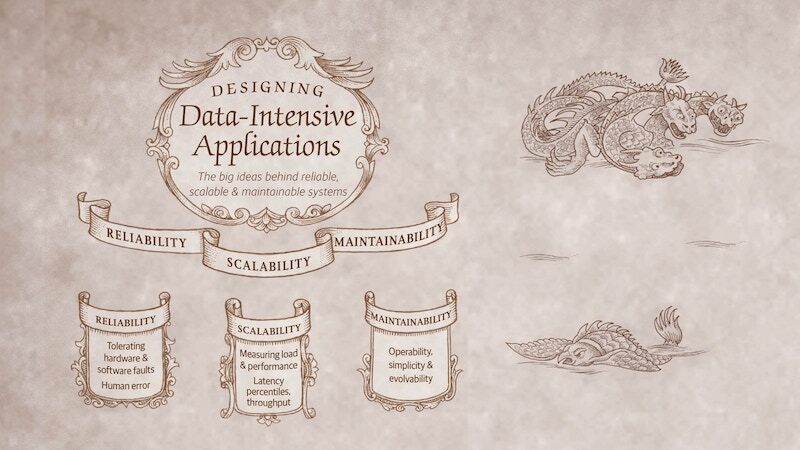 Each chapter in Designing Data-Intensive Applications is accompanied by a map. And we’ve turned those maps into a beautiful poster. The poster is printed in A1 size (33.1 × 23.4 in), full colour litho print on lovely 250gsm silk art paper. Worldwide shipping included (in a poster tube). One print copy of Designing Data-Intensive Applications, first edition, signed by the author. Price: £50 GBP (approx. $66 USD), worldwide shipping included. Designing Data-Intensive Applications contains something very unusual for a computing book: every chapter is accompanied by a map. It is drawn in the style of a geographic map, but it is actually a graphical table of contents for the chapter, showing the key ideas and how they relate to each other. 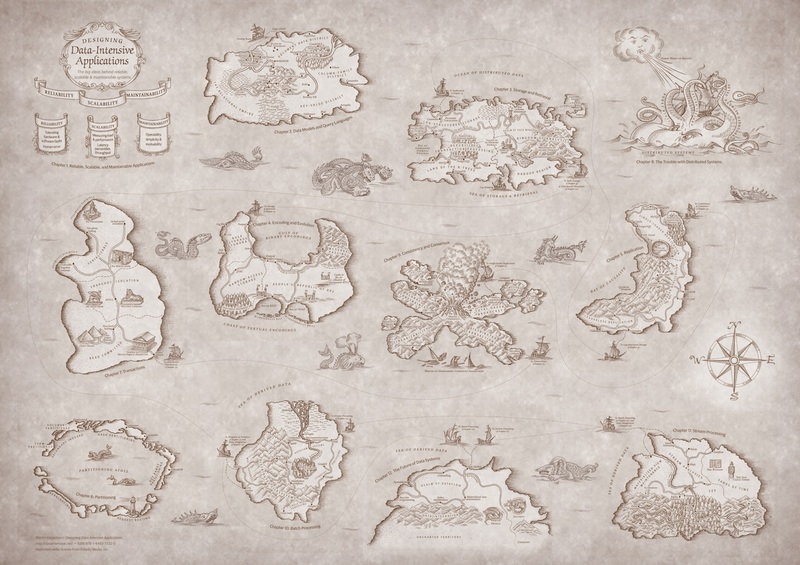 See my blog post to read more about the maps and how they came about. 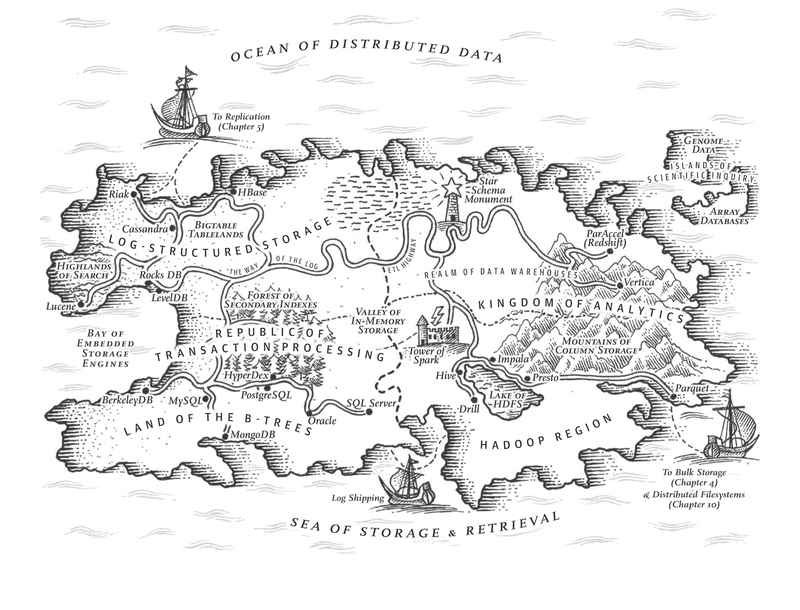 Map illustration for Chapter 3 of Designing Data-Intensive Applications, O’Reilly Media, 2017. Don’t take it too seriously — some of it is a little tongue-in-cheek, we have taken some artistic license, and the things included on the map are not exhaustive. But it does reflect the structure of the chapter: political or geographic regions represent ways of doing something, and cities represent particular implementations of those approaches. Similar things are more likely to be close together, and roads or rivers represent concepts that connect different implementations or regions. Most computing books describe one particular piece of software and discuss all the aspects of how it works. Designing Data-Intensive Applications is structured differently: it starts with the concepts — discussing the high-level approaches of how you might solve some problem, and comparing the pros and cons of each — and then points out which pieces of software use which approach. The maps use the same structure: the region in which a city is located tells you what approach it uses. 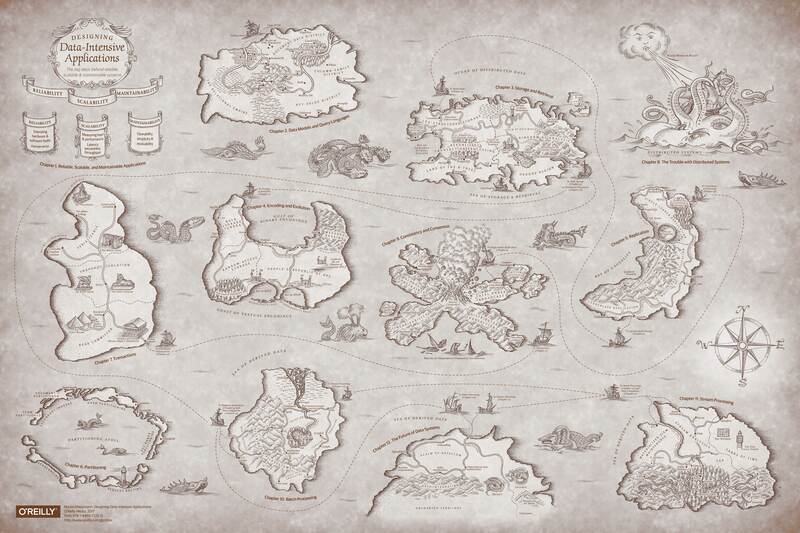 In both the print and ebook editions of the book, the map for each chapter appears at the start of each chapter. However, we have also gone further: we have taken all the maps from the individual chapters, and assembled them into a poster — an archipelago of islands representing technologies in the sea of distributed data. You can download a JPG file of this poster for free (for your personal, non-commercial use only). Poster with all of the maps from Designing Data-Intensive Applications. O’Reilly has given me permission to produce prints of the poster, so in September 2017 I ran a Kickstarter campaign to finance a print run. That campaign was successful, and backers of the campaign have received their posters. I still have some prints left from the print run, which I am now selling through this website. The posters are a high-quality litho print on art paper in A1 size (84.1 × 59.4 cm, or 33.1" × 23.4"), which is big enough that the small text is comfortably readable. I think you'll find the poster is delightful, beautiful, and unabashedly geeky. It will look great on the wall of your office, or make a great prize to give away at a team hack day.